Acrobatic excellence all the way from Bogotá, Colombia, performed by a 13-strong troupe which last impressed Fringe audiences with its 2011 show, Urban. Svalbard Company have been touring this show – a mash-up of circus, music and dance – for a couple of years now, and this Fringe run comes in association with festival favourites Aurora Nova. It's a unique, energetic and by turns laugh-out-loud funny offering from four talented performers, offering a wry dissection of masculinity. Chinese acrobatic expertise meets western music and design in this fun mix of acrobatics, circus skills and dance, set to a feel-good pop soundtrack. Australia's Circa has risen to the top of the circus tree in recent years, with each show taking this exciting, talented company in a different direction. We can't wait to see what they do this year. Arriving on the juggling scene as teenage sensations in the 1990s, Ethiopian duo Bibi and Bichu have gone on to perform around the world. Here they're joined by a team of acrobats for this semi-autobiographical tale of two brothers. 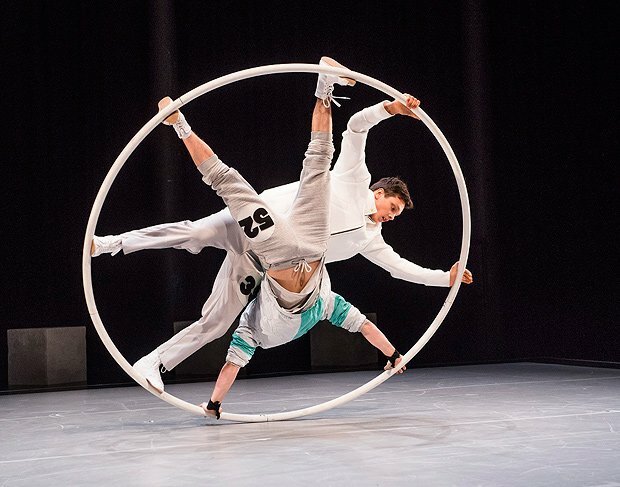 Inspired by Fritz Lang's 1920s's film, Metropolis, Quebec's Cirque Éloize finds a way to have fun in a grey world, with world-class acrobatics, juggling, Cyr wheel and more. Award-winners at this year's Adelaide Fringe, Swedish circus troupe Fauna mixes contemporary circus with live music to explore primitive behaviour. A big hit with its previous Fringe show, Bromance, England's Barely Methodical Troupe returns with another batch of acrobatic trickery, mixed with dance, parkour and b-boying. Budapest's Recirquel Company take us back to 1930s Paris, with aerial work, acrobatics, juggling and more, all served up in a decadent, cabaret-style package. The first Fringe outing for St Petersburg youth circus Upsala, who dare to mix the unpredictability of the ping-pong ball with their acrobatics, clowning and live music. Quality and excellence go hand in hand with the name Gandini Juggling, so expect to be suitably impressed by the company's latest show, which fuses Indian classical dance style Bharatanatyam with juggling and percussion. Canada's Flip FabriQue impressed the crowds with last year's Fringe show, Attrape Moi (Catch Me), so hopes are high Transit will feature more dynamic diablo, juggling, trampoline and acrobatic action.